If you have never grown marijuana, either recreational or medicinal, then these CBD Auto Cheese seeds are the perfect choice. With changes in Canadian laws allowing for the cultivation of marijuana plants for personal use, many residents are beginning to grow their own cannabis and enjoy its recreational and medical effects. Both Cannabis and Marijuana seeds are the same, for some, such as the British and many European’s, it’s Cannabis. For the majority of the USA and Mexico, it’s Marijuana, same plant, different name. Medical and recreational marijuana does differ however, with differing ratio’s of THC and CBD, two of the primary compounds formed by the plant. While THC is enjoyed by recreational users for the ‘high’ it generates, CBD is preferred by medical users for its therapeutic benefits. CBD Auto Cheese is the easiest medical marijuana strain to grow, and can be cultivated either indoors, within a purpose built growing area. Or, outside from Spring through to early Fall. Its autoflowering characteristics allow it to grow, flower and fully mature in just eight weeks from germination, regardless of the number of daylight hours the plants receive, generating it’s best yields and harvests when subjected to as many hours of direct sunlight as possible. Autoflowering seeds require no reduction in light hours to commence flowering and fully mature, with an 18 hour light cycle normal, and 20 hours of light a day producing some of the best results. These very easy to grow autoflowering CBD seeds require no prior skill or experience to produce high quality buds with an 8% CBD and THC content providing an even 1:1 ratio, maximizing its medicinal benefits. CBD has undergone extensive trials across many parts of the world, with reports showing it can aid a wide range of conditions and medical ailments, from stress and depression, to assisting in the treatment of cancer, and the effects of chemotherapy. Although not the biggest yielding strain, CBD Auto Cheese can produce between 150 – 250 grams per plant given ideal conditions, and with seedlings requiring as little as eight weeks to completely grow, flower and mature, you could be just a couple of months away from harvesting your own herbal medicine. Cheese marijuana is well-known across the United Kingdom and Europe, winning several awards for its pungent aroma and mouth-watering, unique flavor.With its enhanced CBD ratio and reduced THC content, CBD Auto Cheese is one of the fastest ways to generate your own, high quality medical marijuana, at a fraction of the cost. 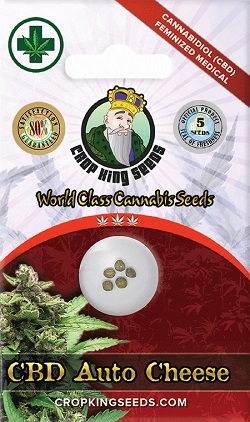 You can buy CBD Auto Cheese medical marijuana seeds through us in packs of 5, 10 and 25 feminized seeds per packet. Enjoy secure payment and delivery options, click below to enter the shop. Buy CBD Cheese Auoflower Seeds today and receive fast discreet shipping to Canada and all US states.